Here is another Wenger with the icon of a vintage or veteran car. This is a very well-known knife called Motorist and I have been looking for when this was introduced first. So far I have put this from 1977 in the Personalized Series. Anyhow from the very late 1970s this knife can be seen and it is interesting because you can find that this knife follow the evolution of the tools. It got the old embossed icon and the pad printed type. The knives you can find information about on the internet too. Wenger introduced the two new series in 1977 called Personalized and Sportsman Presentation. 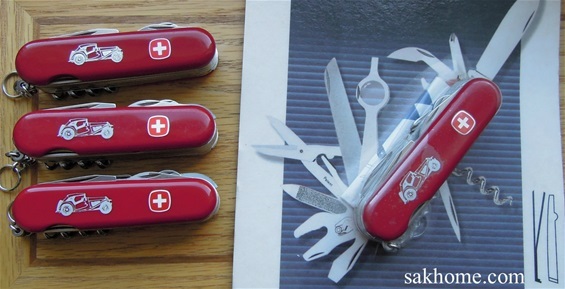 Most Wenger knives or Swiss Army Knives are sportsman or sportsmen knives but these two series are extra interesting. People can identify the knives with a sport or interest and these knives are extra interesting to me. These knives are decorative and the selections of tools follow the icon in the scale. The tools and icons are designated for the different sports and interests. On the pictures are knives from +-1980-1990s. We must also remember in history that icons in the scales was not a new invention at all and that from 1980 advertisings and more personal knives started to get a new boom with new production methods. It is also important to have in mind that the car icon has been used on other knives by Wenger.